"National and International Lobby[ing] and Advocacy," claiming "to bring the situation of the poor and marginalized to the attention of communities around the world." Donors include: European Union, Norwegian Refugee Council, Misereor (Germany), Diakonia (Sweden), Trócaire (Ireland), Association for Development Aid -AGEH (Germany), Embrace the Middle East, and UNDP. While claiming to “offer insight into our work through the publication of our annual narrative and file reports,” and that that “transparency is an important issue,” St. Yves does not provide financial details on its website or in any of the aforementioned reports. The most recent narrative report published is from the first half of 2010. Between January-December 2016, Society of St. Yves was an “implementing partner” for a project through the Norwegian Refugee Council for $6.8 million to “protect the rights of Palestinians in the West Bank and Gaza Strip affected by displacement.” Other implementing partners were Jerusalem Legal Aid and Human Rights Center (JLAC), HaMoked, Community Action Centre, Yesh Din, Bimkom, Palestinian Centre for Democracy and Conflict Resolution (PCDCR), Palestinian Centre for Human Rights (PCHR), and Al-Mezan. Condemns “restricting Israeli measures such as roadblocks, checkpoints and the separation barrier as well as arbitrary and punitive practices of closures within the West Bank,” completely ignoring the context of violence and terror, as well as Israel’s right to defend its citizens. In May 2018, Society of St. Yves signed a call to the UN Human Rights Council to launch an “independent investigation into violations of international human rights and humanitarian law by Israel.” The call accuses Israel of “excessive, indiscriminate and disproportionate use of lethal force… [that] may constitute war crimes and crimes against humanity” (emphasis added). 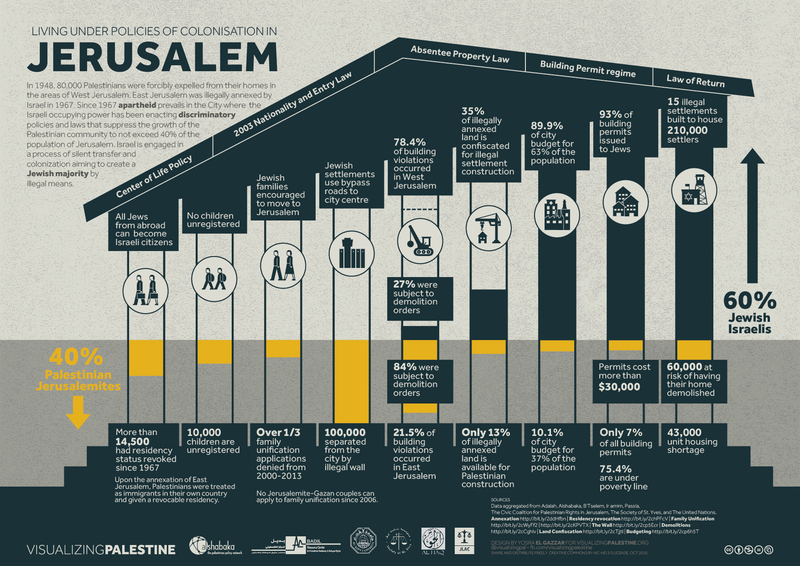 In January 2017,Society of St. Yves, alongside Al-Haq, BADIL, Al-Shabaka, and Jerusalem Legal Aid & Human Rights Center (JLAC), released an infographic aimed at “raising awareness of Israel’s apartheid policies in the city, its effects on the Palestinian population, and the gross violations of international humanitarian and human rights law that arise.” The infographic claims that “Since 1967, apartheid prevails” and that Israel has “been enacting discriminatory policies” in Jerusalem. Regularly contributes to Kairos Palestine’s “Christmas Alerts.” In the 2016 alert, Society of St Yves accused Israel of “grave violations” of international law and committing “psychological violence” against children. Member of the “Displacement Work Group,” an initiative of Badil and OCHA, comprised of NGOs including: Addameer, Al-Haq, Al-Mezan, AIC, ARIJ, Badil, BIMKOM, B’Tselem, CARE Intnl., DCI – Palestine section, Diakonia, EAPPI, Ir Amim, ICAHD, Maan Development Ctr, MAP UK, Oxfam UK, Oxfam Solidarite – Belgium, PA Govt. Spokesperson, PCHR, RHR, Society of St. Yves, Save the Children UK, Shatil, UNFPA, Stop the Wall, ACRI, UNFPA, WCLAC, World Vision, and Yesh Din.